Do you have an enviable collection of antique firearms and also do the business of selling these priced firearms? If so, you must prepare a bill of sale for transferring the ownership of that firearm to its new buyer. If you are wondering where to find that bill, then please stop worrying. 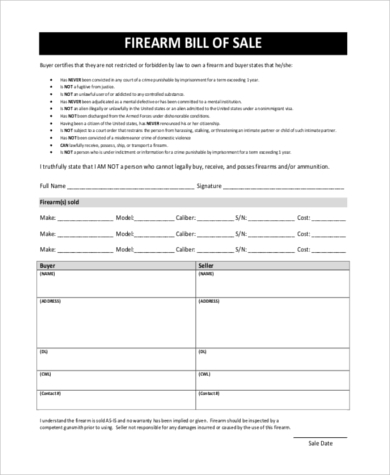 Our collection has many templates designed as Firearm bill of sale just like Bill of Sale Forms. 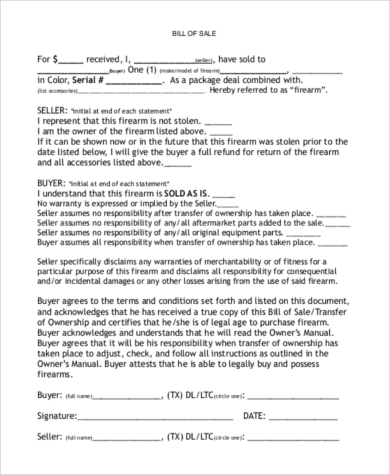 Any seller who sells Firearms can download this simple Firearm bill of sale template for keeping it as a record while transferring their ownership to the buyer. Just customize and use it. 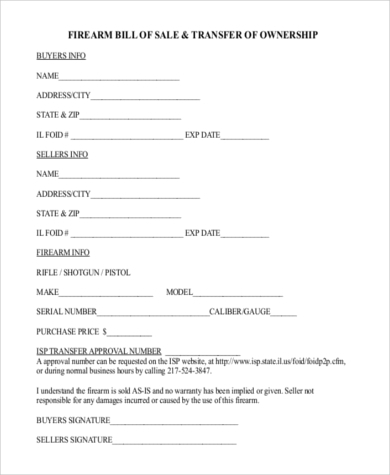 For selling your firearm, you can download this Private party Firearm bill of sale template, for transferring your ownership rights to its buyer and keeping the records of both the parties. You may also see Bill of Sale in PDF. This free Firearm bill of sale is a definite download for any person who wants to sell firearms to some buyer and wants to keep this form as a transfer record. 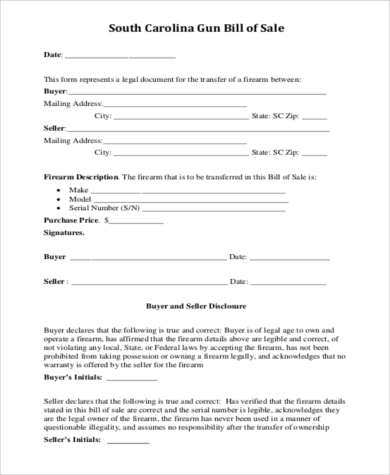 For anybody who is an owner of the firearm, and is interested in selling them to new buyers, this sample Firearm Bill of sale template can be helpful to you. Download and customize it. You can also see Firearm Bill of Sale. 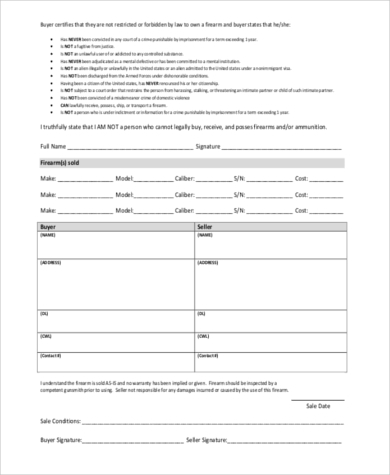 Any buyer of Firearm can download this printable Firearm bill of sale template for making a contract or agreement with the seller, for transfer of ownership of Firearms. Edit it and print. 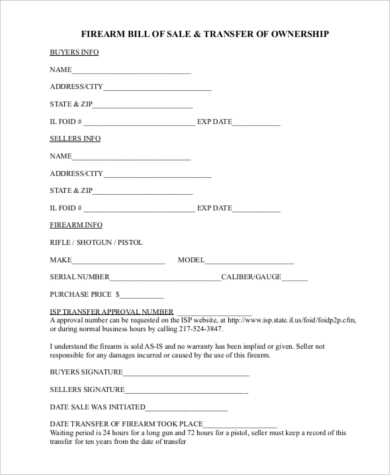 Simply download this personal Firearm bill of sale template for carrying out the procedure legally, in transferring your ownership of Firearm to its new buyer. It can be edit fully. You may also see Blank Bill of Sale Forms. This Firearm bill of sale & transfer of ownership template is meant for sellers and buyers who wants to carry out the transfer process legally. Edit the content and print to use. 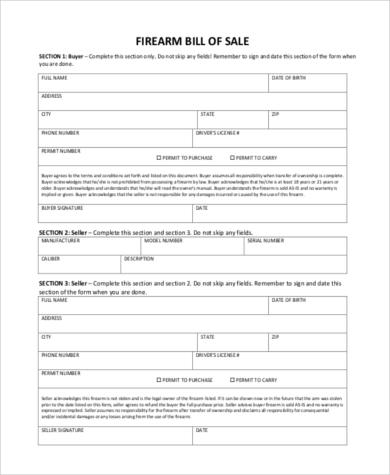 Usage of Firearm Bill of Sale Forms? An agreement has to be made while selling or transferring of ownership of Firearms from the owner to the buyer, who is interested. A Firearm bill of sale form has to be created for this procedure. The form contains the details of the seller, the buyer, the model number of the Firearm, the condition of the Firearm and everything corresponding to that particular Firearm, has to be mentioned there. This is done for striking the deal between both the parties so that everything remains in black and white for future reference. You can also see Gun Bill of Sale Forms. Target Audience or Benefits of Firearm Bill of Sale Forms? Any seller of a Firearm who wants to sell their firearms, irrespective of any condition it is in, to interested buyers will require this Firearm bill of sale. The ownership rights can be transferred in a legal manner by using it, from the buyer’s and seller’s perspective. This Firearm bill of sale form helps in avoiding any misunderstanding between the parties, as the detail of the Firearm gets mentioned here, including theirs. Mostly available in PDF format, there are several templates as Firearm bill of sale, available with us for your requirement. You may also see Bill of Sales.